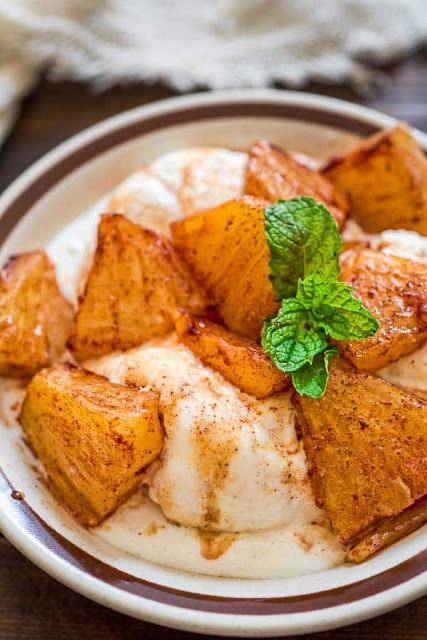 Try this simple, yet scrumptious, Cinnamon Fried Pineapple. It requires just a few common ingredients and only 10 minutes of your time. Cut the pineapple into small bite-sized pieces. (Check the video instructions above for reference). Set a large skillet over medium heat and add the butter, honey, cinnamon, and salt. Stir to combine. Add the pineapple pieces and fry for about 2-3 minutes on each side. Remove the pineapple from the skillet and serve. Enjoy the pineapple as is, or serve it on top of vanilla ice cream. 0 Response to "CINNAMON FRIED PINEAPPLE RECIPE"